Today I took part in yet another Field Trip for Parents organized by the kids’ school. 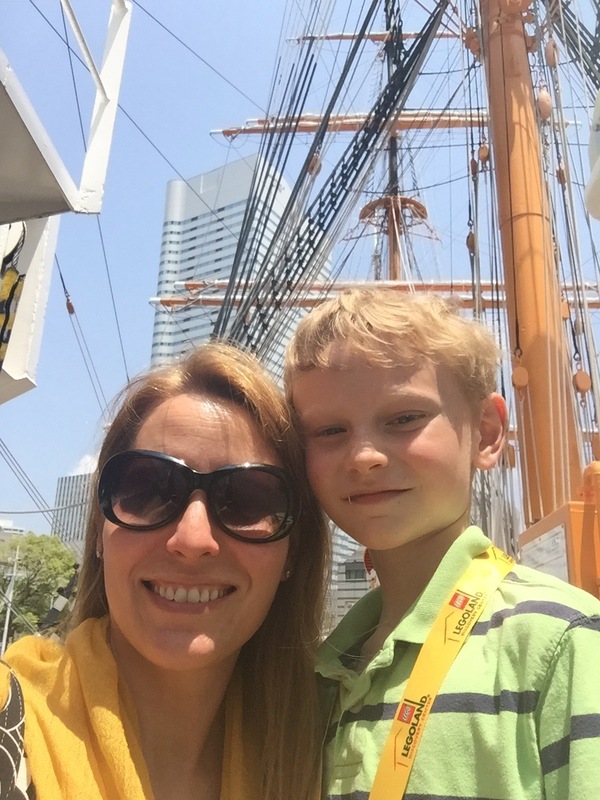 Our group of eleven St. Maur parents joined an equal number of participants from the other international school in town, Yokohama International School. We set off on the train for a cooking class at the Yokohama Fish Market. Because I am a giant nerd–huge–I prepared for the cooking class by packing kitchen towels, an apron, a cap, clogs, and my knives. Upon arriving at the fish market I had to surrender the clogs–you know, shoes with closed toes and non-skid bottoms, designed specifically for safety in a commercial kitchen, etc. Instead I received a pair of plastic sandals that likely came from the 100 yen store and hosted hundreds of feet since they were last cleaned. At least I wore socks today. After a short introductory video we headed into the demo kitchen. The staff demonstrated how to fillet aji, or horse mackerel. It’s a small round fish, and I’ve filleted lots…and lots…of round fish. They asked for two volunteers from each school; I was itching to do it and wondered how to raise my hand without looking like too much of a geek. Thankfully my fellow tour-goers had me covered! 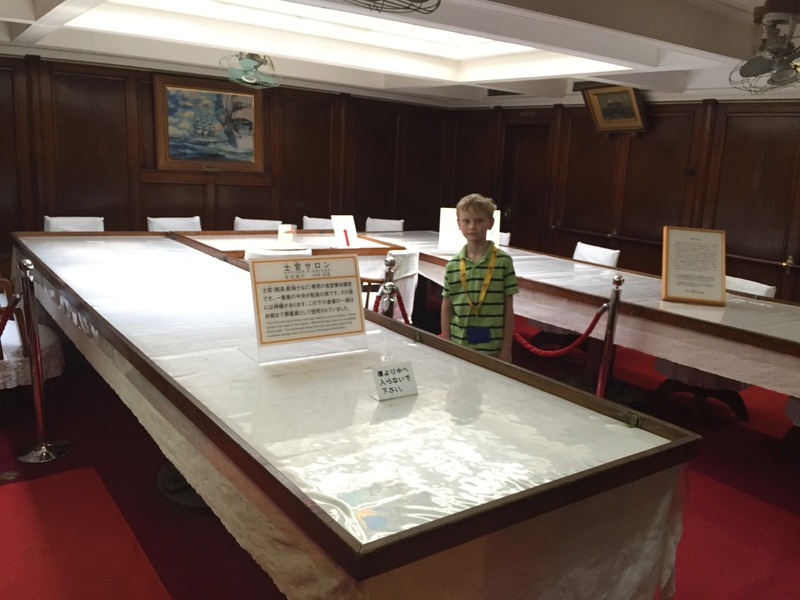 They essentially pushed me forward and I couldn’t have bowed out if I tried. Cleaning fish left handed. Because I am, in fact, left-handed. My instructor seriously did not know what to do with this added complication, but we push on through. I stepped up and followed the example set by the fish market staff member. He started to guide me through step by step but quickly became flummoxed by my left-handedness. In Japan it’s considered extremely rude to even say no, never mind contradict someone. Within a few minutes it worked out, but it felt like it took forever. I cleaned my fish, removing the guts, skin, and bones, and earning polite applause from the audience. Whew! This just about killed me. And I have no idea why I look so grim. After the fish cleaning came a cooking demo of the days’ recipes: steamed cod with seasonal vegetables, fried wontons with horse mackerel and cheese filling, and fried tuna cheeks and tails. We assembled the steamed cod with vegetables and butter in the same old-school, en papillote fashion that I learned in cooking school. I tend to prefer fish broiled or seared to give it a crisp coat, so I had low expectations of this dish. I was pleasantly surprised by how delicious it turned out. On to Dish Two, friend wontons with horse mackerel and cheese. Cheese and fish sounds…wrong. It sounds even worse when you realize that the cheese in question is called Melting Cheese and includes plastic around each slice just like American cheese slices. And as teammate Manisha discovered, that cheese is really, really secure in its packaging. That said broiled cheese on fish is a sushi-go-round staple and surprisingly delicious, as were today’s mackerel and cheese wontons. I ate a lot of them. Like, really a lot. In retrospect, maybe that plate of wontons sits a little too close to the open gas flame…. The most exciting moment of the day came during the frying of said wontons. I stepped away from the table to pick up some equipment, and my teammates got the paper towel-lined plate of finished wontons a little too close to the gas burner…and set it on fire. “I step away for a minute!”, I declared. The others scrambled around and were all “Put out the fire!” and I was all “Save the wontons!”. Thankfully the fire was extinguished, the wontons were spared, and we all earned a great story to tell over dinner that night. The final dish was pan fried tuna cheeks and tails. The cheeks are just what you think: the face of the fish. The staff leading the demo explained that this cut of fish usually goes straight to restaurants and pubs called izakaya without ever reaching the lowly retail market for people like us. So I really enjoyed the chance to cook with this cut, since I will likely never have the chance again. The preparation was simple: salt, pepper, flour, fried in garlic butter over medium high heat. We cooked the fish five minutes per side, then drizzled it with a splash of soy sauce. Pan friend tuna tail and cheeks. Not so pretty to look at, but oh-so-delicious to eat! In addition to these three dishes, the staff prepared three more: miso soup with crab, turban shells with butter rice, and a dessert of fresh fruit and yogurt creme. After enjoying our meal and a quick clean-up, we stopped for a quick group photo. We thanked the staff for the experience and headed home. 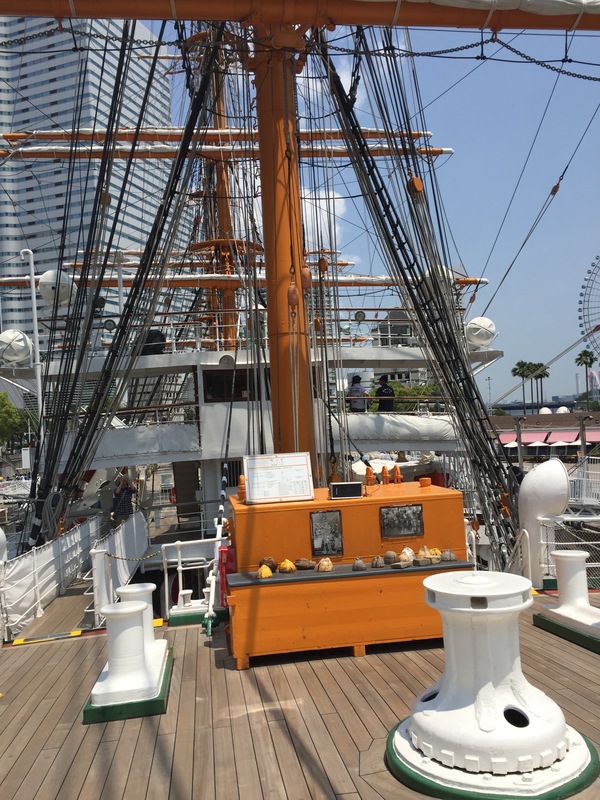 The Yokohama Fish Market is open to the public on the first and third Saturdays of the month; for more information visit https://www.ambassadors-japan.com/en/yokohama-portscape/393/ . Me: Cy! It’s a clear day and I bet we can see Mt. Fuji! Let’s go to the Landmark Tower observation deck. Cy: I don’t want to. I want to go home. Me: Your room is a complete disaster and if we go home you’re cleaning for the next few hours. A parenting win! So we set out by train. 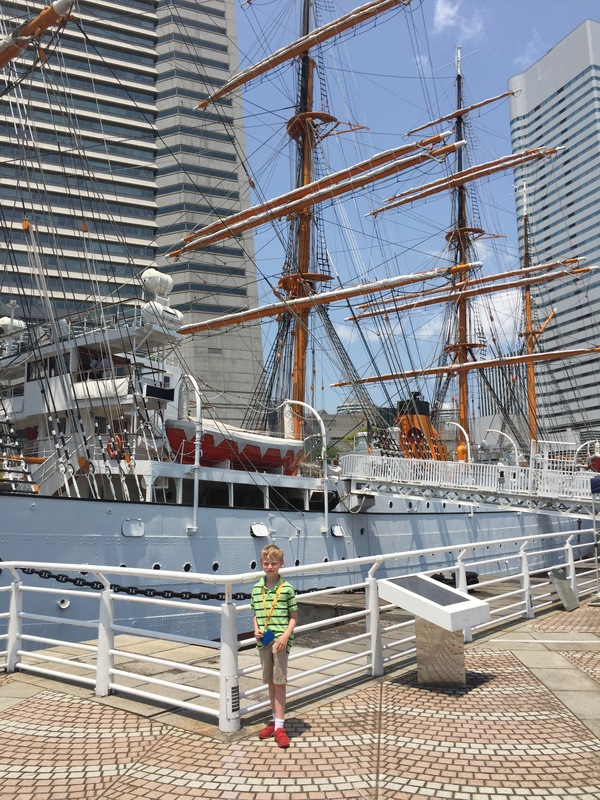 As we exited Sakuragicho Station, Cy noticed the Nippon Maru sail training ship and asked if we could go there instead. I quickly agreed. Most people know how incredibly expensive Japan can be, but museums and parks are an exception. 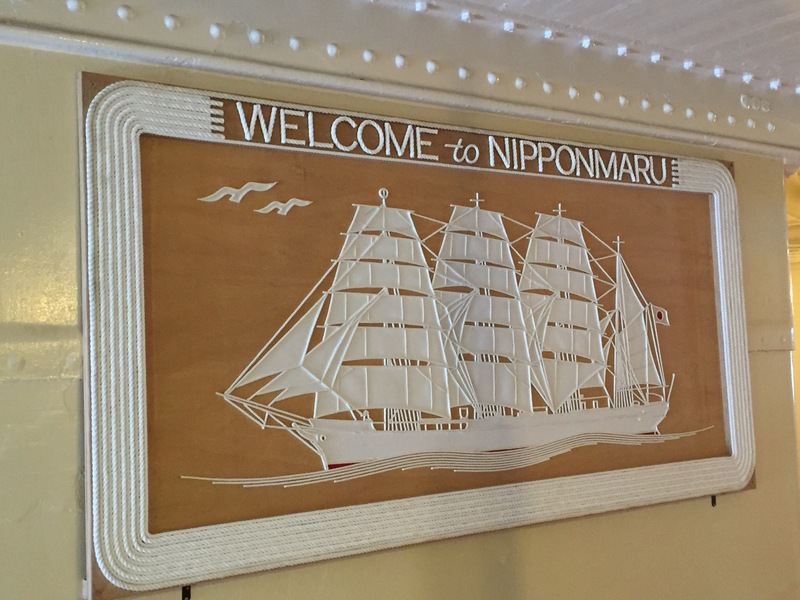 Admissions are generally quite low in price, and our Nippon Maru visit cost only 600 yen (about $5 USD) for both of us. 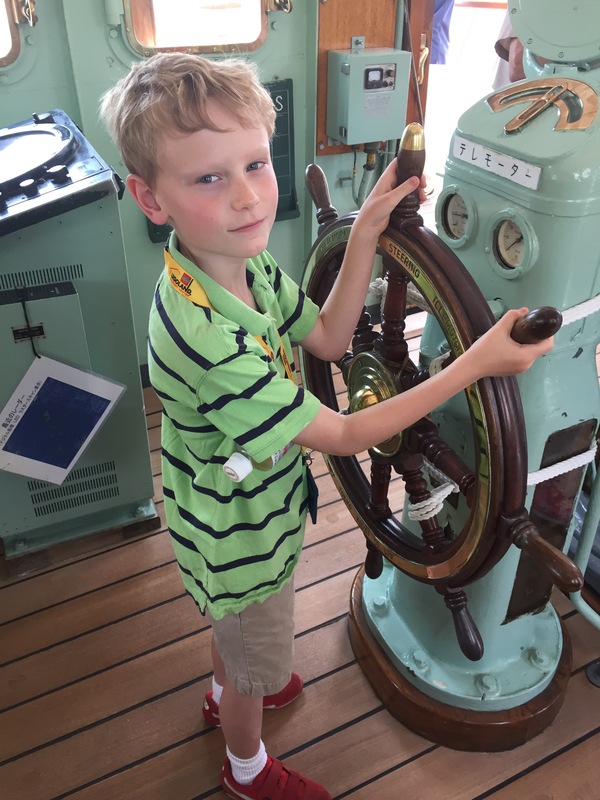 We started wandering the decks and Cy asked random questions, including some that I could answer (“That’s a capstan. It’s a tool for hauling in mooring lines.”). 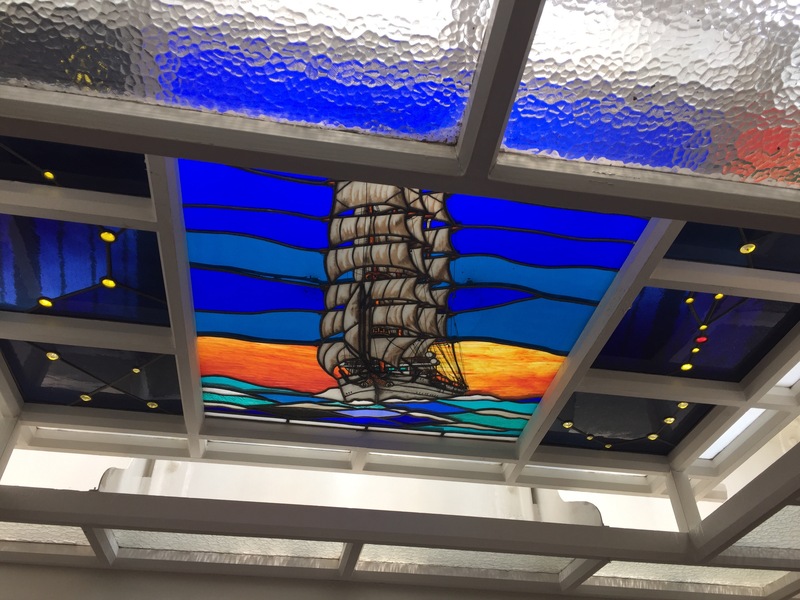 The stained glass adorning the ceiling in the Officers’ Mess. Officers are basically the ship’s One Percenters. As we left the museum Cy declared it “really cool”–silent fist pump by mom. 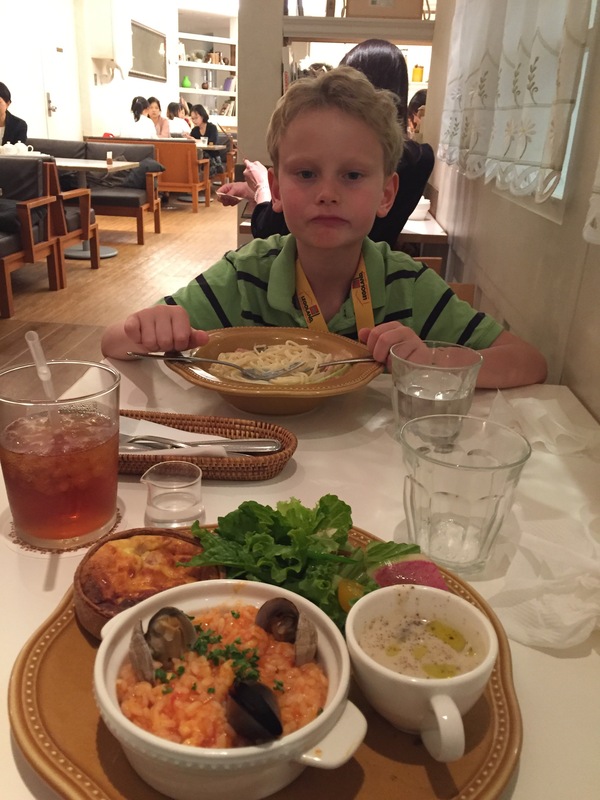 We stopped for a French-inspired lunch at a nearby restaurant, then headed home. Last week my lovely and talented sister Joanna sent me this link about flavors of American junk food unique to Japan. “You find any of these?”, she asked. “Of course!”, I replied. And I do see odd versions of American staples like Kit Kat, Doritos, Cheetos, and Ritz most times I go to the store. I don’t usually buy them, though. Until now! Joanna’s question got me thinking. Not only do I have the chance the try unique-to-Japan flavors of American junk food–thanks to the commissary (grocery store) on base, I also have the chance the purchase the original American version at the same time. So this brings us to the first round of taste testing of Japanese and American flavors of the same item, which took place tonight after dinner. When I first thought of this idea I weighed the testing options: single blind, double blind, just ripping the bags open and eating, and so on. I leaned toward the Just Eat option myself, but the kids got bowls out and Mark donned a blindfold before I could say a word. So single blind it is. The bags look remarkably similar: same size, same graphics. I expected them to taste the same as well, and we were surprised to find that they differed quite a bit. The American Nacho Cheese flavor tasted like…well, Doritos. The Japanese Mexican Taco Taste version tasted more like taco seasoning and sugar–imagine a packet of Old El Paso taco mix, plus sugar. Our blindfolded subject immediately picked out the Japanese version. Three family members preferred the American Nacho Cheese version, while one, Obviously Lacking in Taste But Will Remain Nameless family member (cough cough Tessa) preferred the Japanese version. Coming up: different junk food, with different blindfolded family members. Stay tuned! Today I visited a tea house in Yokohama with a group of moms from the kids’ school. Our guides for the day were members of the Kanagawa Systematized Goodwill Guide Club, or KSGG. KSGG volunteers organize outings, run tours–and help dress foreigners in yukata, or cotton, summertime version of kimono. KSGG volunteers provided the yukata and all accessories. But ever the overachiever, I brought my own! Last week I visited a second hand store chain called Off House, and on impulse I picked up a pretty blue yukata for only 500 yen, or about $4.50. I had the belts and hair accessories from Tessa’s kimono adventure and brought those along as well. When I bought the yukata I wasn’t even sure if it was a woman’s yukata, or if it was the right size, or how to wear it–so I’m really glad that I brought it along. It fit perfectly, and I appreciated the tutorial. Once fully dressed we knelt for the tea ceremony itself. The KSGG volunteers talked us through the steps and rituals which boil down to one rule: when in doubt, bow. After rendering our feet completely numb due to 30 minutes of sitting on our heels, it was time to shuck the yukata, take funny pictures in the bamboo forest, and head home. Where can you buy a mini dustpan and broom shaped like Mickey Mouse, or his and her ear swabs, anyway? Before moving to Japan I too spent sleepless nights pondering these very questions, and now I have the answer: the 100 yen store! Dollar stores in the U.S. tend to locate in somewhat dodgy neighborhoods and typically stock…well, junk. Our house in Washington DC sits in a textbook Transitional Neighborhood; go one mile west and you’re surrounded by the U.S. Supreme Court, the Capitol, and stately homes that start in the millions. Travel one mile east and D.C. Police set up checkpoints to allow only residents into certain neighborhoods due to shooting sprees. One guess which neighborhood hosts my nearest dollar store. You’ll buy those incredibly bizarre items, because hey, it’s only 100 yen! Items at the 100 yen store actually cost 108 yen with tax. This means that frequent 100 yen store shoppers get really good at their 108 multiplication tables (17 x 108 = 1836 yen. Obviously.). Some larger items cost more, but they are clearly marked 150, 300, and so on. The Daiso is the 500 lb. gorilla of 100 yen stores, and today I stopped by my favorite location (3F above Baytown on Honmoku Dori, for you locals out there). As usual, I went in with a short list that included only two items: two different sized trash bags. And also as usual, I came away with significantly more items. As I wandered about I started snapping photos of the different departments to capture the broad variety of life problems that Daiso solves. I’d like to point out the great risk I took in capturing said photos. A sign above the register clearly indicates No Photos, and I can’t even claim that I can’t read it because it’s a picture of a camera with a big red X through it. So you’re welcome, people! In the weeks and months to come I’ll expound on different departments, different 100 yen stores, and my absolute favorite oddball items. For today, let’s hit some highlights! And the best reading glasses ever. Aren’t they actually/vaguely attractive?